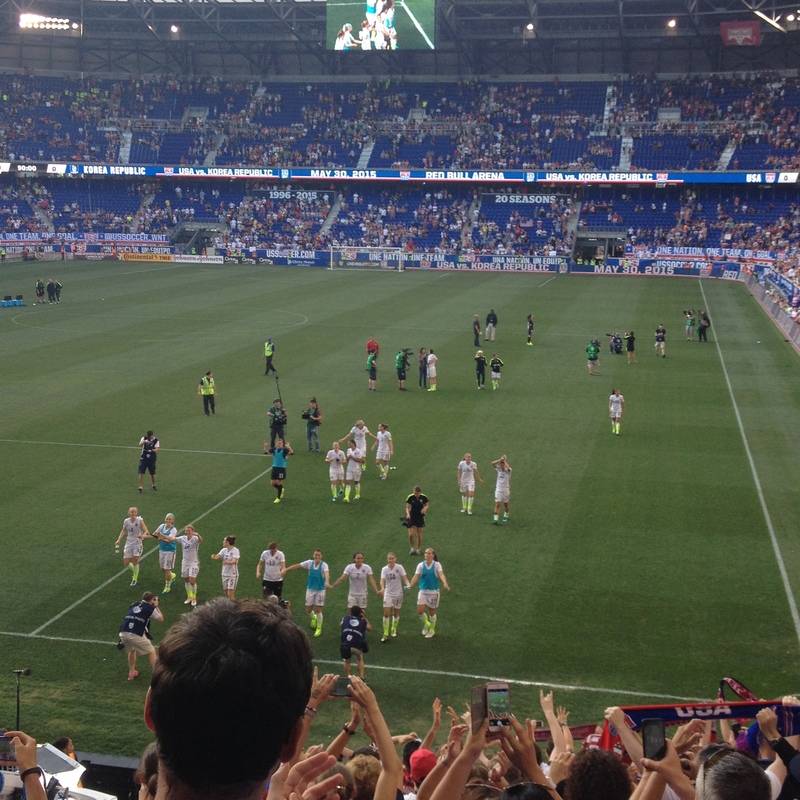 Yesterday afternoon in front of a sold-out crowd at Red Bull Arena in Harrison, New Jersey the USWNT faced off in the final match of their send-off series against fellow Women’s World Cup competitor Korea Republic. The game ended in a 0-0 draw as both teams were unable to convert any of their chances. With the World Cup beginning in Canada in less than a week, this match should have been a preview of what to expect when the U.S. takes on Australia in their first game of the group stage on June 8th. It wasn’t. The U.S. might have taken the 2 steps forward, 1 step back approach in this game. Their passes and attempts weren’t connecting as well as usual. Since the end of the Algarve Cup in March, it seemed like everything was coming together. Yesterday it looked like they regressed slightly. That’s not to say this performance was awful. It wasn’t. It might have just been an off day. Everyone has those. It’s better it happens now than in a do or die match during the tournament. There were some bright spots in the match such as the scoring chances that resulted from an occasional combination play and the defensive effort to stop Korea’s attack. Also Hope Solo made a diving stop during second half stoppage time after not being challenged all that much during the match. The save allowed her to secure another shut-out to add to her growing U.S. record. Overall though, the U.S. attack wasn’t as threatening as it had been the last few games. Korea’s technically sound game may have had something to do with it. They limited the U.S. to only 15 shots, 5 of which were on frame, and 3 corner kicks the entire match. Compared to the 29 shots with 13 on goal and 7 corner kicks in the Mexico match 2 weeks ago, it was a big difference. This blog post might seem a little less in depth than usual. I credit that to the fact that I was unable to focus on the match and take notes like I typically do. However, that was only because I was fortunate enough to see the match live. I made the trek to New Jersey yesterday afternoon to catch the final send-off match. It was a great atmosphere with the amount of people there to watch the team, but honestly it was boring to watch at times. The play seemed pretty back and forth. There were few real scoring chances. Korea seemed to be on the ground a lot resulting in a bunch of U.S. fouls. I also feel like I missed certain chunks of the second half because I moved my seat to sit with my friend and the people he was with in the supporter’s section (it was so fun standing). It’s a totally different experience for me watching live than watching at home, which I’m sure can be said for anyone watching any sport. Watching on TV, I tend to be more focused on the actual game and the action happening where the ball is. Watching live, I tend to focus on certain players. I look at the bench from time to time. There might be something going on around me. Basically there’s more distraction. I end up noticing less than usual. At the same time, getting to see anything live is always special. It’s kind of a trade-off, but I’m glad I went to the match. Despite the outcome of the match though, this team will be ready. I know it. There’s nothing to fear or worry about. The World Cup will bring out the best of the best. It’s the greatest tournament that these women will play in. I doubt they will let this opportunity pass them by (especially those that lost in 2011). This is officially my last post of “The Countdown Continues” series I started to countdown til the World Cup. It’s been great recapping and writing about this team in the lead-up to Canada 2015. I can’t wait do the same during the tournament with a 2015 Women’s World Cup blog series. Hopefully there’s spectacular accomplishments and highlights to write about from this incredible group of 23 women on the USWNT. I believe. Do you? See you in 8 days. FIFA Women’s World Cup Trophy. 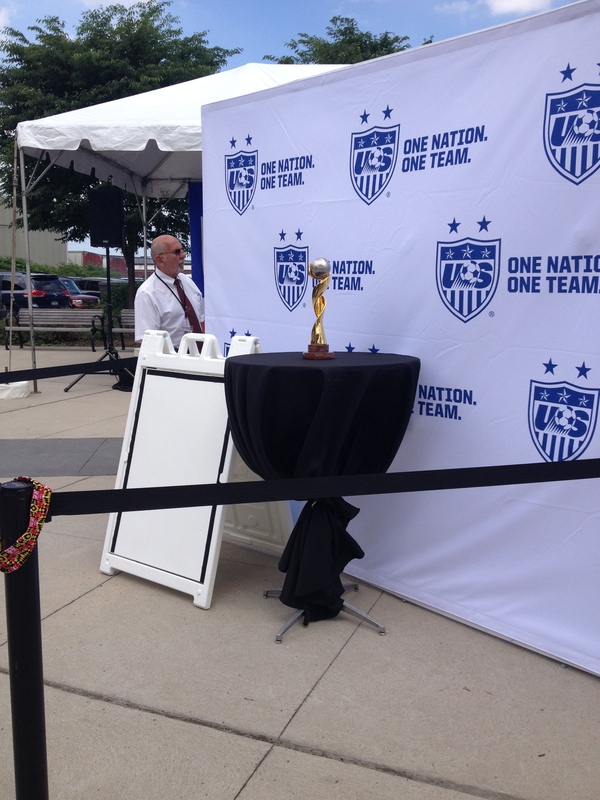 Hopefully it will be in the hands of the USWNT members on July 5th. 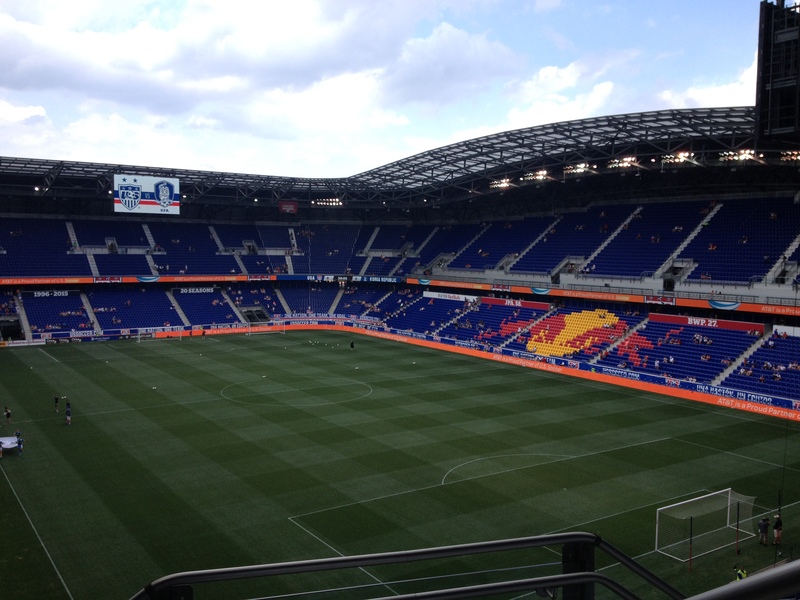 A view of the pitch from my seat at Red Bull Arena in Harrison, New Jersey. Thanking the supporters after the match.